Showing results for tags 'north texas football'. At which position would you like to see most improvement in 2018? I had this discussion with a fan last night and it turned it to a good debate. Join Harry, @TheReal_jayD and @GMG24 as we discuss UNT's first Fall Camp practices of the 2018 season as well as the latest in recruiting and of course the big opener against SMU. As the 2018 North Texas football season inches closer, there is no disputing the level of excitement and anticipation is reaching a fever pitch. Optimism abounds and it’s not just from the die-hard fans who frequent the GoMeanGreen.com fan website. 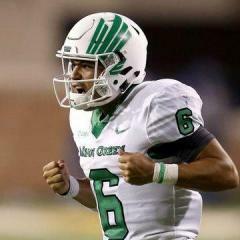 The Mean Green were picked to place first in the Conference USA Western division in the league’s 2018 preseason poll and junior quarterback Mason Fine was selected as the league’s most valuable offensive player. UNT returns 17 starters, and pretty much it’s entire coaching staff including head coach Seth Littrell who led the program to bowl games in both of his first two seasons. They also can boast the #1 ranked 2019 recruiting class in Conference USA according to 247 Sports. North Texas had struggled for most of the past decade prior to Littrell’s hiring in 2015, notching only one winning season in 2013 under then coach Dan McCarney. In 2016, Littrell took a 1-11 team he inherited from McCarney to a bowl game in his first season as head coach. Later, in the summer of 2016 UNT hired athletic director Wren Baker and after solid 2017 performances in all three major revenue sports the future could not look brighter. Yet, despite good signs, as a long down trodden North Texas fan, there is always that chip on your shoulder, and concern that even the best of expectations can be derailed. It's just not that easy being green. If that admission means I fall into the #OLDDENTON category so be it. I could not help but think back to a similar place we – as North Texas fans – found ourselves just four short years ago back in 2014, after an amazing Heart of Dallas bowl win on New Years day against UNLV. Dan McCarney was hired as head football coach by North Texas in November 2010. This hire was the culmination of a prior disastrous hire of high school coach Todd Dodge made by then athletic director Rick Villarreal. McCarney seemed to be everything Dodge wasn’t. He had experience, having been a player at Iowa under former North Texas legend Hayden Fry and the head coach at Iowa State in some of their glory years. Oh, and by the way, he also won a national championship ring as a defensive coordinator at Florida. McCarney immediately played the “major rebuild” card that newly installed coaches like to play, and quite honestly, he was probably right as Dodge had run this thing into the ground. His first season at UNT (2011) in the Sun Belt conference earned him a 5-7 record; in 2012 he regressed to 4-8. Alumni and boosters were antsy. How long and could he ever get things on track? 2013 was the season that it all came together and in hindsight unfortunately extended McCarney’s stay an additional 2-years. North Texas went 9-4, and despite not winning their division were able to secure a rare bowl win in front of a good crowd. Suddenly, the whispers of who would replace McCarney became a chorus of demands to renew his contract as quickly as possible although very few will admit this sin today. There are certainly some similarities between how North Texas fans felt heading into the 2014 season and how they feel now. Int 2014, North Texas was picked to win the West division of Conference USA and Marshall was expected to win the East. UNT returned seasoned offensive coordinator Mike “Chico” Canales and talked defensive wizard John Skladany out of retiring. They returned 5 offensive starters and 4 defensive starters from their 9-4 squad and recruiting had been solid. The season started off roughly on the road at the University of Texas as hopes for a major step forward against a P5 program were dashed. UNT would lose the game 38-7 despite a good defensive showing in the 1st half. In week two, UNT bounced back in a big way, defeating arch rival SMU in Denton by a score of 43-6 and the bandwagon started back up. Fans were bleeding green again. Then reality sunk in after a disastrous home loss against Louisiana Tech by a score of 42-21. After a cupcake win against out-manned Nicholls State, the Mean Green would go on to lose four straight conference games. McCarney would only manage two more conference wins that season against the bottom tier Florida C-USA schools and finished the season at 4-8. Much of the issues UNT faced in 2014 revolved around the quarterback position. They tried several options during the season, including Iowan Andrew McNulty, juco-transfer Josh Greer, and Dajon Williams. None of them seemed to work, with junior, and McCarney favorite McNulty earning the most game reps. UNT hoped this setback season was just a blip on the radar screen but the worst was yet to come. In 2015, McCarney would start out 0-5 and was summarily fired after a disastrous 66-7 loss to FCS program Portland State at home. One could argue that the North Texas program is under solid footing with Coach Littrell and his staff heading into the 2018 season. The biggest difference appears to be the return of junior quarterback Mason Fine. One cannot question the importance of the quarterback position and UNT appears miles ahead of where they were in 2014 both in terms of talent and depth. Mason Fine will go down as one of the most prolific quarterbacks North Texas has ever had on the field. But he is a not a big guy, and with a porous offensive line, he has had some injury issues in his first two seasons. If you lose Fine, it could put you in a similar situation that McCarney faced in 2014 where he had no significant experience at the most important position on the team. A look back at North Texas’ 2017 season reveals that Littrell won a fair amount of close games, especially in conference. UNT beat UAB by only 3 points at home and just bested UTSA by 3 at home with seconds left on the clock. They beat Old Dominion by only a touchdown, and La. Tech by only 1-point. Turn those around and throw in an Army non-conference 3-point win and the season could have looked a whole lot different in terms of the record. UNT also benefitted from some lucky breaks, for instance Southern Miss losing their starting quarterback. And you have to factor in that they lose all-time great field UNT goal kicker Trevor “Ice” Moore. The loss of Moore makes the parity in the conference more concerning heading into this important season. The other factor is the strength of the league. In 2013, many feel McCarney caught Conference USA in a down cycle. In 2013 opponent Tulsa went 3-9, UTEP 2-10, Southern Miss was 1-11 and La. Tech went 4-8. SMU is always a nice win, but that was one of the worst seasons they had in a long time. In 2018 you know the Western division won’t be easy. La. Tech will likely be back strong after beating SMU in the 2017 Frisco bowl. Southern Miss returns a bowl team, UTSA is always tough, and UAB may have some of the best returning talent in the west. The non-conference slate includes a powerful Florida Atlantic squad, a rising Old Dominion program and Arkansas from the SEC. Recruiting is another factor to consider, as 2014 unveiled the stark reminder that in his fourth season Dan McCarney’s recruiting abilities – with a few exceptions - had been abysmal. In 2018, Littrell will have more of his players that fit his system in place. He has proven that he and his staff can identify and develop good offensive players such as Fine, and receivers Jalen Guyton, Michael Lawrence and Rico Bussey. As to whether this skill translates to the defensive side of the ball remains to be seen. If anything, the 2014 season reminds us that expectations can be misleading. There is a real momentum that is being felt around 1301 Bonnie Brae right now. Can Littrell take this program to another level? Or will he fall victim to the curse that North Texas coaches before him have fallen? A solid season could catapult an already amazing recruiting haul into one for the record books and cement Littrell’s legacy as a head coach at the G5 level. I've long been a fan of the College Football subreddit for its humor, in depth analysis and reporting, and just overall good community. The subreddit's main Moderator, /u/Honestly__ went and represented during CUSA Media Days and got some great interviews in of Mason Fine, E.J. Ejiya, and Seth Littrell. The rest of the Reddit thread is a goldmine of good Q&As. I know the first rule of the “Fight Club” movie starring Brad Pitt was you were never to talk about Fight Club. But when it comes to #F19HTCLUB, the official social media moniker for North Texas Football’s 2019 signing class, I feel compelled to break the rule. Not only is this class off to great start with fourteen 3-star ranked commitments in just early July, but potentially looking like it could be one of the best in program history. Perhaps it could even be in the running for one of the top G5 classes in the country. This is new territory for a North Texas program who has struggled at times to land higher ranked players, despite being in a hot bed of Texas high school talent in past years. The 2019 class not only has high rankings, but also many hold quality offers from G5 and, yes even *gasp* P5 programs with significant more funding and resources. One of the only knocks on Seth Littrell in his tenure thus far at North Texas is the perception he has not recruited at a high enough level, certainly in the eyes of the recruiting services. One argument was Littrell’s signing classes did not have enough 3 star ranked players. Another would be that his recruits did not have enough P5 school offers. Here’s the real story, in just over two years Littrell and company has done a remarkable job completely rebuilding the roster and culture of a program that had been decimated after a string of bad hires. You don’t take a 1-win team to a C-USA conference championship game in 2 seasons without upgrading the talent on the roster. Over 50% of the starting line up in the 2017 C-USA conference championship were brought in after Seth Littrell took over. The good news is that the proportion of Littrell recruits will only increase in the 2018 season and there were some good players who redshirted last season making their debut in 2018. And no one has ever questioned Littrell and his staff’s ability to identify and develop talent. One need only look to starting junior quarterback Mason Fine who most every division I program thought was too small to play. Fine passed for 4,052 yards in 2017 with 31 touchdowns making him the #6 ranked passing leader in the entire NCAA. In fact, he sat just one chair behind #5 ranked Sam Darnold of USC (4,143) who just signed with the NY Jets as the 3rd pick in the draft. As North Texas has improved in the win column (9-5 in 2017; 2 consecutive bowls) there are also encouraging signs the recruiting efforts have trended upward each cycle since Littrell’s hiring. That said, the 2019 class – thus far – appears to be the cycle where everything seems to be falling into place. Winning helps for sure, as top players want to join a program that is winning consistently and going to bowl games. In retrospect, the key difference may well be Littrell’s hiring director of recruiting, Luke Walerius. Walerius’ most recent stop was at Kentucky in the SEC and is primarily responsible for North Texas’ recruiting program including organization and talent evaluation. The social media efforts and communication have taken took huge steps since his arrival. When talking to both prospect and commits a common theme is that North Texas is the team showing the most love and the best family culture to them. Another key impact that Walerius has made has been to take the natural resources North Texas has, in terms of staff, location, facilities, academics and communicate it effectively in language that the prospects and their respective coaches understand. 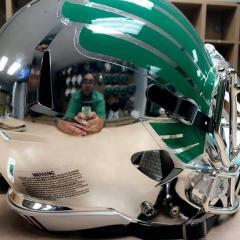 Twitter has become the king of football recruiting and North Texas has embraced communicating it’s strengths in that medium under Walerius’ lead. Two positions they may be set in terms of numbers in this class are WR and LB. Littrell and his staff have had great success at the wide receiver position since coming on board. They are returning Jalen Guyton, Rico Bussey, Michael Lawrence and Jaelon Darden, all guys brought in by current staff. They also have some exciting freshman and transfers that could contribute this fall including redshirt Greg White from Georgia and Kansas transfer Keegan Brewer. There are currently 3 receivers committed to North Texas this cycle including Damon Ward and Deonte Simpson both from West Brook as well as Kealon “Action” Jackson from Shadow Creek. All three have two things in common, speed and versatility. All three will contribute and be exciting in this spread offense. North Texas has had great success at LB in recent history including sending Craig Robertson (Saints) and Zach Orr (Ravens/Retired) to the NFL. In 2018 North Texas will have a very veteran LB Squad led by seniors EJ Ejiya and Brandon Garner. The quartet of 2019 LB recruits could be the most talented group of commits as whole by position. Twins Gabriel and Grayson Murphy (Bishop Lynch) and Taylor Jacobs (South Grand Prairie) all listed at 6-2, 215 and have versatility to play both linebacker positions and the potential to move down to defensive end. The fourth linebacker commit Kevin Wood (Judson) is listed at 6-0 200, and on film is a tackling machine with a nose for the ball. Watching his highlight film is exciting. He also has versatility and speed to not only play linebacker but also slide back to a safety position in the 3-3-5. The quarterback commit position is in good hands as well. North Texas went back to familiar territory and went back to Oklahoma landing the commitment of State Champion Owasso QB Will Kuehne. Kuehne is a very good QB prospect with a very bright future and a ton of potential. He held offers from Maryland, Arkansas State and several Ivy League schools. Defensive back is one of the most important position groups in the 3-3-5 defense. Mean Green added 4 safeties in the last class. I project they will add close to the same number this class. Currently they just have one committed but that one is a BIG one. Jevin Murray (Shadow Creek) is one of the top defensive backs in the state. He can be an instant contributor for defensive coordinator Troy Reffett’s defense. He held 13 offers including multiple P5 offers. Jevin’s main recruiter is special teams coach Marty Biagi who is having a great recruiting season so far. Marty’s covers the critical Houston-area region which many believe has more prospects than any other region in Texas and possibly the nation. North Texas is having great success in Houston this year. including two of the top-rated recruits running back Garrison Johnson (Manvel) and tight end Asher Alberding (Clear Lake). Garrison choose to commit to North Texas over P5 offers including Syracuse and Nebraska. He has the talent to fall right in North Texas run of talented running backs. Asher (6-4, 235) is an intriguing combination of old school blocking and new age receiving tight end. Coach Littrell success with Rob Gronkowski at Arizona played a big part in Asher decision. It will be fun to watch him develop. The hardest position groups for G5 and even P5 teams to recruit consistently on both sides of the ball is the offensive and defensive lines. In the 2019 cycle, North Texas has done a great job finding big athletic guys that you can develop. They currently have two offensive linemen in John Brunner (6-5, 300 / Brock) and Chris Cassidy (6-4, 280 /Angleton). Both fit the build of athletic/people movers that can develop for offensive line coach Chuck Langston. Look for UNT to try and add at least one more offensive lineman this class. On the defensive side of the ball they have one defensive lineman committed in Demeco Roland (6-3, 275 / Broken Arrow, OK). He comes from the same school as Derrick Shaw a defensive tackle signee from last year class that the staff is very excited about. Demeco is another guy with a lot of potential. Look for him to have big senior season. With 14 commits so far, I figure the staff has around 9 to 10 more scholarships to fill out. I would expect 2 to 3 more commits before the season starts. Don’t be surprised if North Texas doesn’t save the rest of the scholarships for the frenzy that happens as signing day nears and prospects realize they can’t all go to Texas and A&M. With coaching changes and stuff, it is a mad dash as national signing day gets near. And in Seth’s time at North Texas they have really capitalized on some of these later commitments. There is also the opportunity to add some junior college transfers at positions of need. Of course, when you sign the best, you better be prepared when bigger schools lose their commits and decide to start poaching. In prior regimes, North Texas seemed ill prepared for this annual ritual. With Walerius managing the process, it appears that the program is doing everything you have to do to circle the wagons, maintain strong relationships and keep these committed players in place. Time will tell. This is an exciting time to be a North Texas fan. There can be no doubt that North Texas is trending upward in the college football ranks. Back to back bowl games and a trip to the conference championship is potentially just the tip of the iceberg. Between the talent added last class and the talent currently committed this could be the boost needed to push North Texas to the top of G5 rankings and beyond. For a long time UNT has been referred to as the “sleeping giant” due to great location, and school size. But now all the necessary pieces seem to finally be in place to take that next step. North Texas is benefiting from great leadership starting with university president Neal Smatresk and athletic director Wren Baker. North Texas made a phenomenal coaching hire in Seth Littrell and with the aid of director of recruiting Luke Waleruis. #F19HTCLUB could be the signing class that finally woke the sleeping giant. March 23, 2018 http://www.meangreensports.com/sports/m-footbl/spec-rel/032318aab.html DENTON – The spring game typically puts a close to all the work throughout the course of 15 practices, however, North Texas still has three practices remaining once festivities wrap up Saturday. The Mean Green are anxious to show off their progress at Apogee Stadium. North Texas athletics has an exciting day in store for its fans Saturday, including the faculty and staff fun run and appreciation picnic at 9 a.m., followed by the Mean Green garage sale in Apogee Stadium’s west side concourse (VIP/season ticket holder access at 9:30) at 10:30 a.m., a pre-game tailgate presented by the game’s title sponsor (Verus Advisors) at the south end of Apogee Stadium and the Mean Green Spring Game at noon. Fans will get a close look at one of the nation’s most exciting offenses, led by junior quarterback Mason Fine. Four of the team’s five leading receivers from 2017 return, providing Fine with a plethora of weapons including Jalen Guyton, Michael Lawrence, Rico Bussey, Jr. and Jaelon Darden. North Texas also has a deep group of running backs, led by Nic Smith and Evan Johnson, while newcomers DeAndre Torrey and Loren Easly look to impress after strong performances throughout the spring. The running back group has big shoes to fill after Jeffery Wilson’s graduation, but a lot of talent remains in the North Texas backfield. Defensively the Mean Green have put in a great deal of work to improve on their performance in 2017. Redshirt freshman Tre Siggers made the transition from running back to safety, and is part of a group that includes returning starter Khairi Muhammad, redshirt junior Taylor Robinson and sophomore Makyle Sanders. Members of one of the most important positions in the secondary for Troy Reffett’s aggressive defense will have another opportunity to solidify their spots. The defensive line has a new look following the departure of Andy Flusche and Tillman Johnson, and a handful of new faces include a pair of junior college transfers on the outside in Darrian McMillan and Tuulau Saafi, as well as interior lineman Dayton LeBlanc. They, along with key returners LaDarius Hamilton, Roderick Young and Ulaiasi Tauaalo will be looking to test the North Texas offensive line Saturday. Chuck Langston’s group has continued to grow and improve this spring, but still has work to do ahead of the fall. The unit returns center Sosaia Mose, Elex Woodworth and Jordan Murray. Fans will also get their first look at junior college transfer Thomas Preston III, who has made a strong early impression. Several freshmen who redshirted last season have seen positive transitions in the weight room, including Jacob Brammer and Manase Mose. The spring game, which has split teams by offense (white) and defense (black), has a unique scoring system in place, which is described below: OFFENSE DEFENSE Result Points Result Points Touchdown 6 Touchdown 7 Field Goal 3 Takeaway 3 Two-Point Conversion 2 Three-And-Out 2 Fourth Down Conversion 2 Fourth Down Stop 2 Three Consecutive First Downs 2 Safety 2 Explosive Pass (16-Plus Yards) 1 Stop (Force Punt) 1 Explosive Run (12-Plus Yards) 1 Sack 1 Point After Touchdown 1 Tackle For Loss 1 The day begins with special teams drills at noon, followed by the team presenting some of last year’s seniors with their jerseys, and then the scrimmage. Also taking place on campus Saturday is a softball doubleheader against Louisiana Tech beginning at 1 p.m. at Lovelace Stadium and a soccer scrimmage against Baylor at 2 p.m. at Mean Green Soccer Stadium. Immediately following the spring game, Verus Advisors is also hosting a post-game event on the promenade of the south end of Apogee Stadium. The White, Green and Black parking lots will be for suite and club seat holders, and parking passes will be emailed. The Blue lot and Fouts lots will be open to the public. There is a dance/drill team event at the Super Pit that same weekend, so parking in the Fouts lot may be limited. Season tickets for 2018 are on sale now, starting at $65. Fans can purchase tickets through the Mean Green athletics ticket office. For more information, visit MeanGreenSports.com or call the ticket office at 940-565-2527 or 800-868-2366. POLL: Which bowl would you prefer UNT to be in? When will we get a new uni announcement? So the new UCLA jerseys were accidentally leaked by Under Armor, and this sparked my mind wondering when are we going to get that new uniform announcement. I know there has been talks especially from a recent post that there will be new uniforms for the upcoming season. I'm hoping it's sometime later this month, I know it's a great recruiting tool and as a student and fan I'm really looking forward to seeing what the Mean Green will don next!